Stop Septic and Sewer Gas Odor from PVC Vent Stacks! Eliminate offensive odors from your plumbing vents on your roof, or vent stacks over your septic drain field. Our activated carbon vent filter has more than twice as much carbon filter media of many other filters on the market. Easy To Install! No Gluing Neccessary! Stop septic odor coming from plumbing vents, holding tank vents, and drain field vents. No more foul air drifting into open windows! No more spoiled patio parties or cookouts! 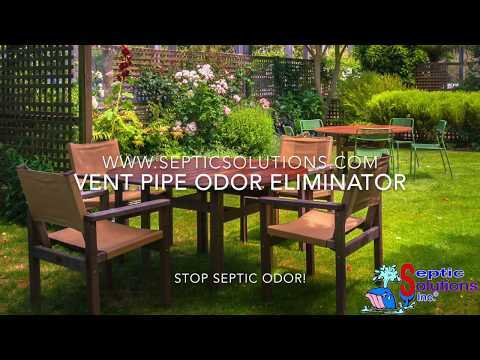 Q: Does the Septic Solutions' Vent Pipe Odor Eliminator only work on septic systems? A: The Septic Solutions Vent Filter will work on any type of PVC vent, whether it be from your septic system or the plumbing vents coming from your house. Many people who purchase this product are on city sewer and do not even have a septic system. If you are getting odor from any vent pipe, the Septic Solutions Vent Filter will stop it! Q: How do I measure my pipe? A: The pipe measurements are for the ID (inside diameter) o f the vent pipe. This is the measurement you should take in order to choose the correct filter. Q: How long does the activated carbon last? A: This depends on the airflow from the particular vent that the filter is being installed on. In general the carbon pellets will be effective for 3 - 5 years. When the odor returns, we sell pre-packaged replacement carbon pellets. Simply empty the cannister of the old carbon media, and replace with the new bag of pellets. Q: How does the Vent Pipe Filter install? A: The Septic Solutions Vent Pipe Odor Eliminator is a slip fit installation onto any SCH40 PVC vent stack. There is no gluing neccessary. Eliminates Odors using Activated Carbon!